World football governing body, FIFA, on Wednesday paid tribute to former Super Eagles striker, Rashidi Yekini, who died exactly four years ago. 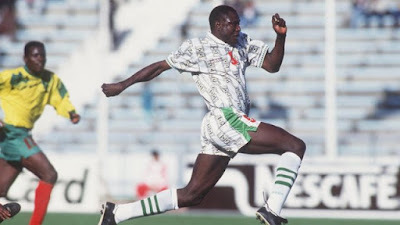 Yekini, 48, died in Ibadan, Oyo State on Friday 4 May 2012, after a brief but serious illness. FIFA recalls that "Nigeria's record goalscorer (37 goals) ensured his name went down in the history books when he scored the Super Eagles' first ever FIFA World Cup goal at the 1994 finals in the USA in the 3-0 group stage win over Bulgaria." "Yekini who played for several clubs in Spain, Greece, Portugal and Switzerland, could hardly believe he had scored and spontaneously grabbed the net, shaking it in celebration. "The photo of the 58-time Nigeria international captivated the world and even today the former striker, who in 1993 was the first Nigerian to be voted African Footballer of the Year, remains a respected figure in the global football family. "Rasheed Yekini was one of the best players at the 1994 FIFA World Cup in the USA," said former FIFA President Joseph S. Blatter when he learned of Yekini's death. "Against Bulgaria he scored Nigeria's first ever FIFA World Cup goal, a strike that will earn him a place in the annals of Nigerian football. He will be sorely missed," the website wrote.